There is a reason that cupcakes mean a party. They are an easy way to serve a crowd. 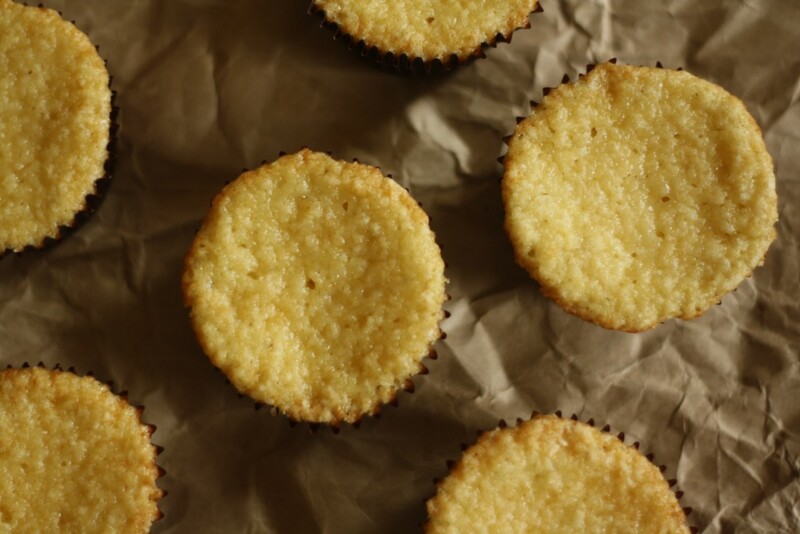 When you turn your typical cake recipe into cupcakes you end up with pan after pan of them. 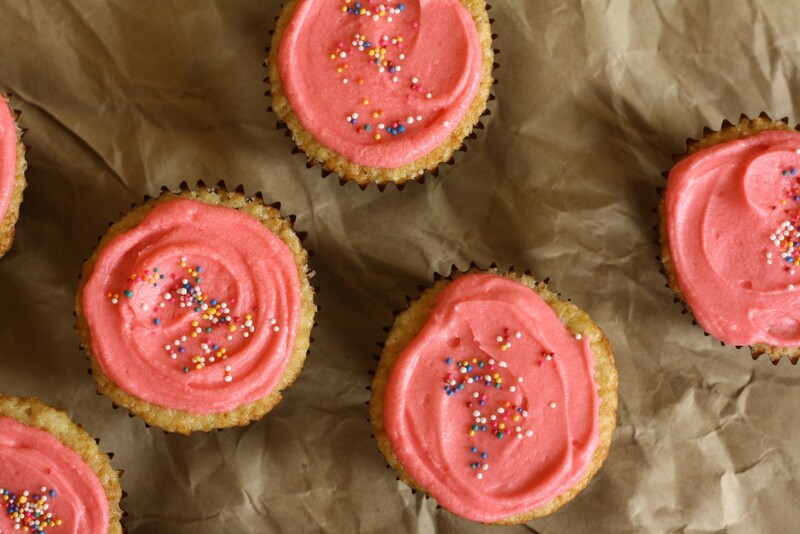 Cupcakes tend to multiply as quickly as the space on your countertop disappears. Sure you say, I’d be happy to bring some cupcakes! You think: that will make everyone – your co-workers, the whole sports team, a birthday party full of children, or any other appropriate group of hungry humans that your daydream may be forgetting – so happy! Fast forward to when you are frosting your 49th cupcake and the questions start. Why, you ask yourself. Why did I sign up to bring in treats for everyone? How am I going to bring these on the train? Why did I think I could start this at 8pm after going to happy hour? 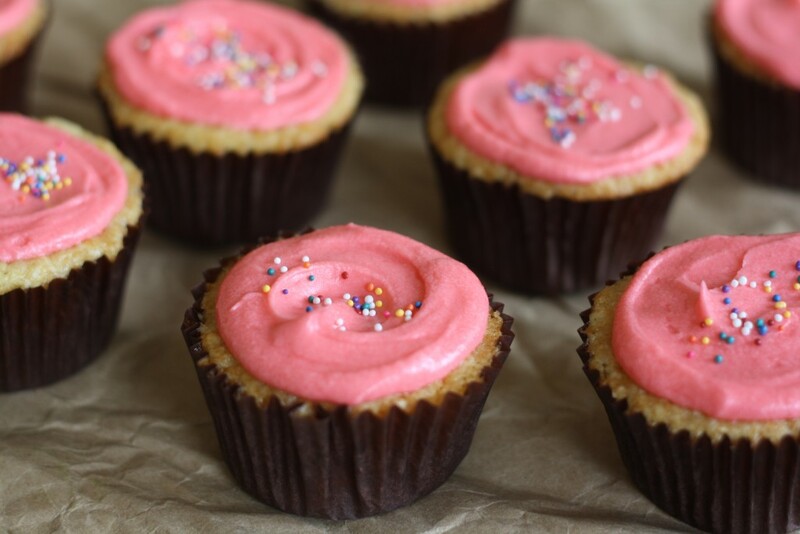 Perhaps you are having a dinner party with just eight friends and want to serve cupcakes for dessert. Maybe you have to go to a potluck and have only committed to a portion of the treats. Or you want to eat a cupcake at 11am and can’t bring yourself to making 67 spares. I won’t judge. 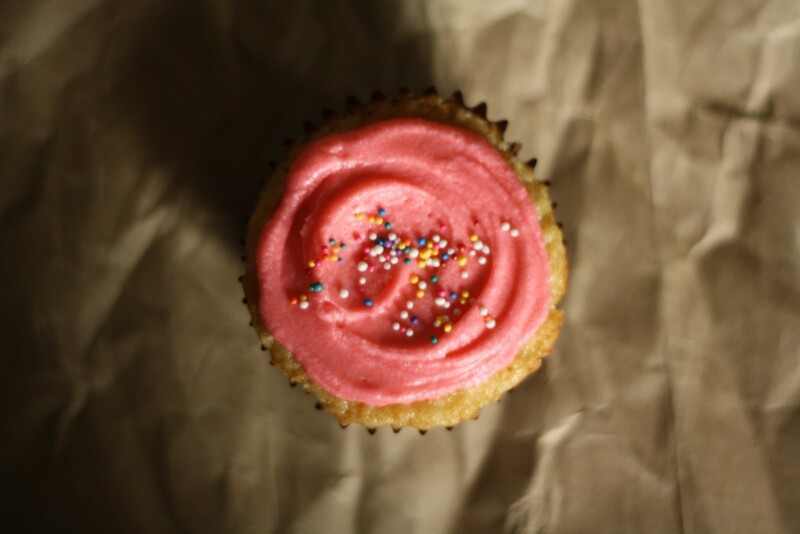 Whatever the situation, there are times when you just don’t need five dozen cupcakes. Sometimes life calls for only one dozen frosted cupcakes. I don’t know about you but these times tend to the be the same moments when I only have one stick of butter and an egg left in the fridge. Good news pals! I have a recipe for you. 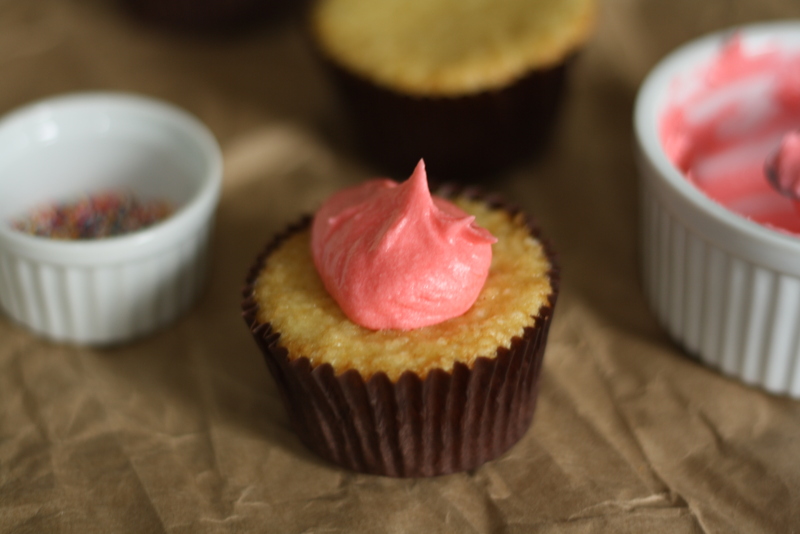 With only one stick of butter, you can pull off the kitchen trick of a lifetime and whip up a dozen cupcakes WITH frosting. I know how bonkers this seems but I speak the truth. Raise your hand and say sure. You’ve got this in your back pocket and you know you’ll be fine. 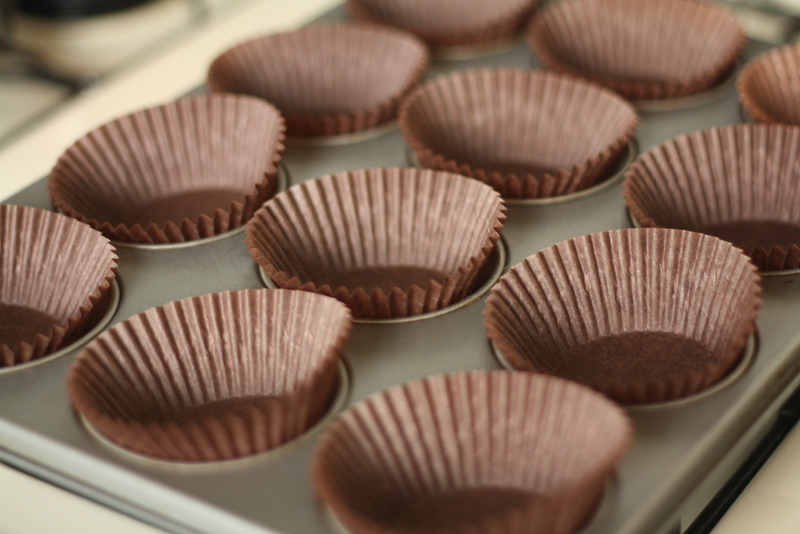 Preheat the oven to 325 and fill a cupcake pan with liners. Combine the flour, sugar, baking powder, salt and butter in a large bowl. Beat with an electric mixer until the mixture is a sandy consistency and everything is combined. Measure the buttermilk (or milk) into a liquid measuring cup. Pour about half of the buttermilk into the flour mixture and beat until just incorporated. Break the egg into the remaining buttermilk, add the vanilla and whisk them together until combined. Add to the flour mixture and mix until the batter is smooth. Divide the batter between the 12 cups; each will be about 2/3 of the way full. Bake for 20-25 minutes or until a tester comes out clean. Let the cupcakes cool. Make the frosting while the cupcakes are baking. In a medium bowl beat together the butter and the powdered sugar until well combined. Add the extracts to the milk and slowly stream into the powdered sugar mixture. Increase the speed of the mixer and beat the frosting for least 5 minutes, or until light and fluffy. Add a drop or two of food coloring and stir until no streaks of color remain. Frost the cupcakes. 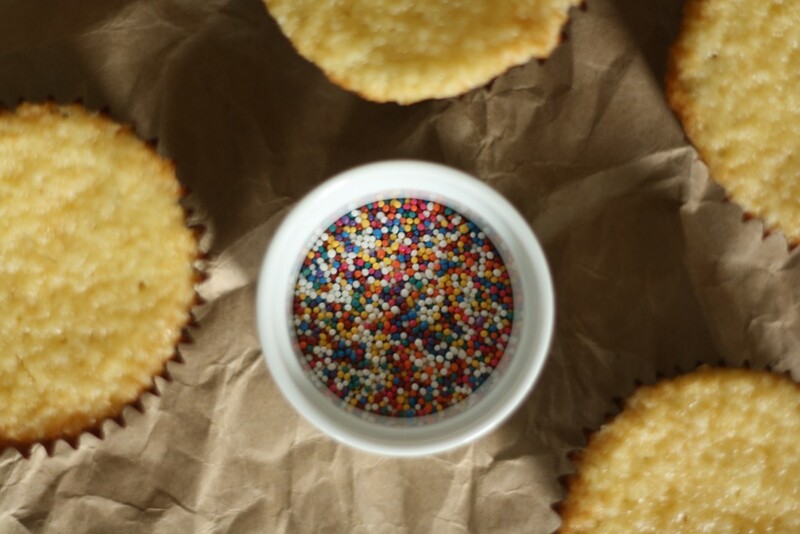 Decorate with the sprinkles. Host a party for twelve. You Are A Genius! It’s completely brilliant! Hello from an appreciative Carroll Gardens reader – this is amazing. I am always trying to halve or third recipes for baked goods and they are always turning out wonky. so glad to hear this recipe helps! it’s a good one to have when you need it! thanks so much for the recipe! I wanted to bring cupcakes to my son’s preschool class of 8 for his birthday, but didn’t want a ton of cupcakes leftover. You’ve saved the day! Hooray! So happy to hear that! This may be a silly question but could I use this recipe for a small cake instead of cupcakes? Not a silly question at all! I think the batter would fit nicely into two 6-inch pans. Just be sure not fill them too much past halfway. 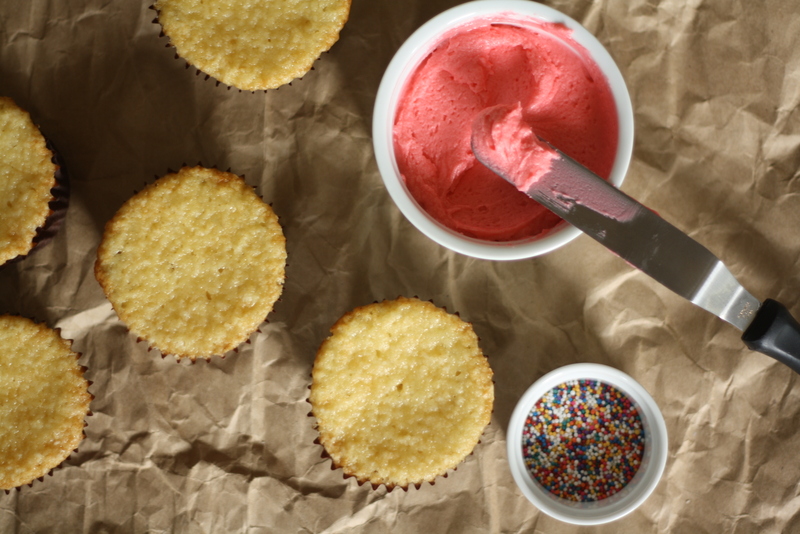 And with any extra batter, you could make just one or two cupcakes! I know this is an old post, but boy did I just fail at these cupcakes today. I filled 2/3 of the way up and the completely overflowed, ruining my freshly cleaned oven. I just made a second batch. I made sure to follow the instructions exactly. The exact same problem. I think based on the rise pattern that it may be too much baking powder in relation to the amount of flour. It tends to sink in the middle and then overflow. Hi Georgina – I’m so sorry to hear that you were having problems with these!